Hello from Chicago, Illinois, as we draw close to the end of summer. It is still hot most days, and the spirit of the outdoors is evident in all the events and activities around town and by the lake. Chicagoans and Chicagoland folks seem to make the most of their time outdoors as soon as the first signs of spring appear and before the cold season sets in. There are many outdoor arts and culinary events, including art fairs and free concerts, as well as numerous lovely parks and nature preserves to enjoy. For me, as an artist, one of the most enjoyable activities of summer is seeking out the seasonal flora I would like to paint. I believe I would always need to live near a botanical garden, both for my spiritual wellbeing and for material for my art-making (the latter unavoidably having its commercial aspects, but can't complain, as it's such a pleasant career), wherever I resided in this world. With their sheer abundance of flowering plants, The Chicago Botanic Garden and local plant conservatories such as the Garfield Park Conservatory provide much of my visual resources for paintings. The main type of flora that thoughts of summer evoke to me is the aquatic: the water lilies and lotuses. There is something magical about the combination of water and flowers. During childhood, I recall making miniature water gardens in a bucket or tiny garden pond, or arranging floating flowers in bowls on my parents' or granparents' coffee tables. Perhaps its charm for me is that water is such a calming and cleansing element, a natural cooling agent against searing summer heat, and the sight of lovely, vibrant flowers floating on it is a bonus. Yes, everything living comes out of water, and it is therefore a common occurence. But the wonder and beauty of it, as far as I can express it in words, lies in the relationships between plant and water: the colour variations and contrasts; the elegance and seeming joy of the blooms bursting forth; and the mirrored relections that visually bind them together in such picturesque ways. The sky and sun are also involved in the scenes, reflecting in the water and highlighting and enhancing the sculptural forms of the flora. Add to the mix a gentle breeze that makes the lotuses gently sway, and we have an idyllic scene of the sort that inspired Claude Monet's paintings. 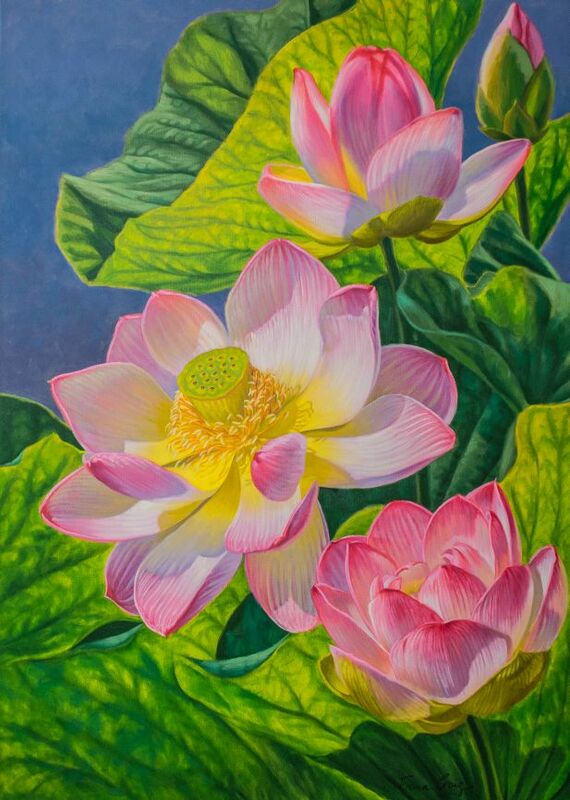 'Pink Lotuses 2', Fiona Craig, oils, 30" x 42". 'Yin-Yang-Water Lilies', Fiona Craig, oils on wood panel, 18" x 24". One of my most enjoyable image-collecting experiences took place at the Garfield Park Conservatory a few summers ago. I was invited by Kathy Cahill, the aquatic plant botanist responsible for the Monet-inspired designs of the lily pond displays, to photograph IN the pond. On the day appointed, she supplied me with the appropriate wading gear, and guided me into the pond by the hand as if I was a young child learning to walk, in order to find my 'sea legs'. Walking was indeed a challenge, but after a few minutes of struggling with the weight of the boots and the resistance of the water, I was on my own and in my element: water! It was a wonderful, memorable experience photographing the lotuses and water lilies up close and personal. 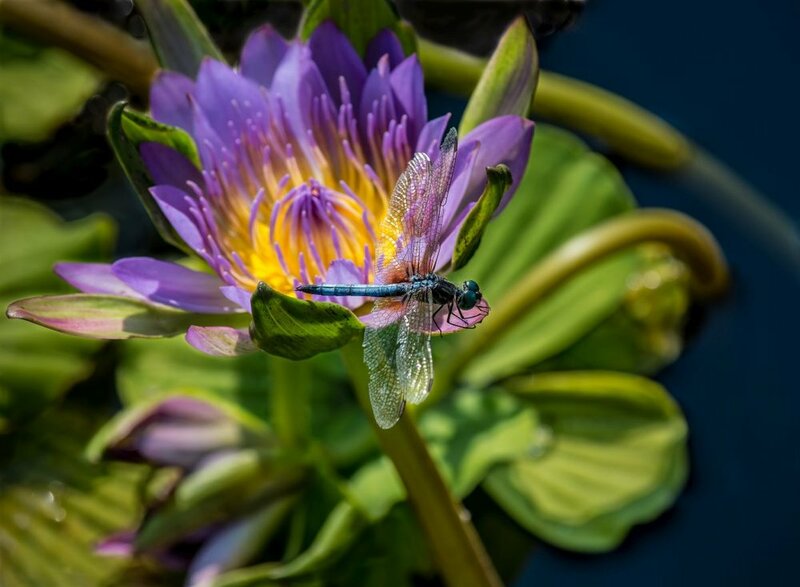 Aside from lily ponds in the botanical garden and the plant conservatories, there are several lily ponds in nature preserves around Chicagoland. It is quite a different experience seeing ponds in authentic settings such as wetlands, albeit that many of these locations are nurtured and maintained in order to conserve them and their ecosystems. Conservation is vital, to be appreciated and supported, so the human touch is not really a deterrent to my inspiration. One such place I draw such inspiration from is the North Park Village Nature Preserve. While it is relatively small, it produces beautiful scenes throughout the seasons. Inspired by North Park Village Nature Preserve: 'Lily Pool 1', Fiona Craig, pastels on wood panel, 18' x 24". A little artistic license on my part has turned some of the white water lilies pink. Lilies of the type that grow in earth are also a favourite subject during summer. While day lilies are ubiquitous around the city and suburban gardens, I make a beeline to the Chicago Botanic Garden to find the most variety of lily types available in one spot. Asiatic (oriental) lilies are my favourite varieties to paint, and there is no shortage of gorgeous blooms to inspire. Many artists throughout the centuries have painted and drawn lilies because of their lovely shapes and contours. They are a 'natural' for artistic elegance. The symbolic significance of any flower in the sense of 'the language of flowers' is of little interest to me, as I don't want to be confined by mythical notions. What I'm primarily concerned with is their visual appeal. That said, I'm very aware that colour and light are important to the mood of an artwork, so that there is symbolism in that sense. 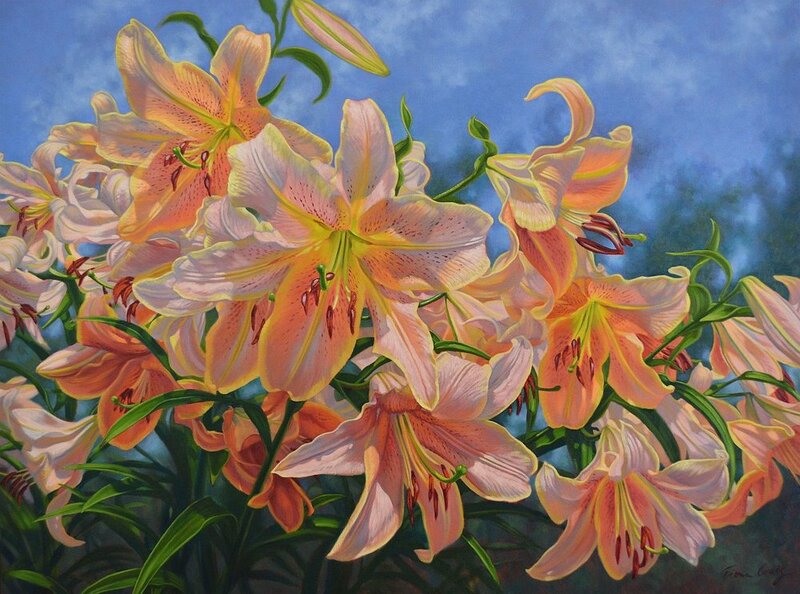 The moods my lily paintings evoke to me revolve around happiness, such as fond memories of the gardens of my youth. There is also the place of flowers in human history to contemplate and draw ideas from, which I allude to in some of my series (a subject in itself for another blog). Lilies and other beautiful and strange flowers speak of exotic exploration in the historial and contemporary senses for this Australian living abroad. For instance, it is interesting to me to find that some tiger and leopard lilies at the garden are native to North America. 'Oriental Lilies 2: Red Hot', Fiona Craig, oils, 40" x 54"
Speaking of North American native flora, I'll mention that I'm no botanical expert and I'm gradually learning about it as I go along. The sunflower is probably the most popular and well-known, but I've read that the varieties for crops and florists are apparently not like the original natives. Something like corn not resembling the original corn, I suppose. Perhaps someone can inform me further, but in the meantime, I am really enjoying painting sunflowers! Cone Flowers (echinacea) are abundant in hot pink and other colours. They often occur (or are planted) with other natives for both aesthetic and practical purposes, which makes a beautiful splash of colour on the landscape. All in all, there are too many floral muses to paint in one lifetime! Summer is just one of the four seasons I find inspiring in the Midwest, and I have described only a small fraction of it. My thoughs are that I can enjoy a bloom or a scene just for itself, with all its wondrous benefits. Resigned as I am to the fact I will not be able to paint everything I want to paint, and that many of my adventures provide temporal and spiritual experiences, I am also collecting visual data in my memory and imagination. I hope to extend my outdoor material-gathering using my new plain air easel. Meanwhile, I spend as much of my time as possible creating special studio experiences that involve extending and preserving those outdoor expeditionary experiences, employing and enjoying the alchemy of the art-making processes and their results.